Also posted in other forums/selling sites. Pristine, hardly used Chord Mojo with 6" Silver Dragon USB cable. 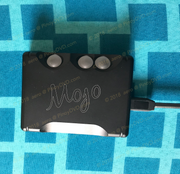 Chord Mojo mobile DAC and headphone amp -- you know what this is and what it can do. Also comes with the original Mojo box and cable. Silver Dragon USB Cable by Moon Audio is a $130 value. The Silver Dragon was created with ultrapure silver conductors for the best in signal transfer for your digital music. The cable uses 99.99998% UP-OCC Stranded Silver 24AWG Teflon insulated stranded conductors with a double layer shield to ward off outside interference. Click here to read more about this cable. RFS: After a year I still haven't gotten used to headphones, still really listen at home on my dedicated 2-channel setup. I estimate less than 20 hours (and that's being generous) of use on this.